Clyde’s promotion hopes have been hit by an injury to star striker David Goodwillie during Saturday’s win over Berwick Rangers. Goodwillie suffered an arm injury in a collision while scoring Clyde’s second goal - his 14th of the season - in the Bully Wee’s 3-0 victory. And although he played on until being substituted near the end, tests have now shown that he has suffered a fracture. Clyde boss Danny Lennon said: “It was typical of the courage and desire that David shows every time he pulls on a Clyde jersey, that he continued to play on after hurting his arm. “We will give David all the support he needs to get back contributing on the pitch as soon as possible. “That’s in the hands of the medical team. David’s a sad loss not just for us but for any club. Taking his goals out of it, he’s got a terrific workrate and is a good, experienced player. Goodwillie is likely to be out for three weeks at least, although he won’t miss a game this weekend as Clyde have a day off due to scheduled opponents Elgin City’s involvement in the Scottish Cup. 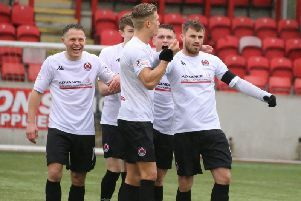 Saturday’s win at Berwick was Clyde’s fifth in a row and stretched their unbeaten run to ten games as they kept pace with promotion rivals Edinburgh City and Peterhead. Lennon said: “We had to be cautious as Berwick have posed us some difficulties this season already. “But we were professional in our approach to the game and the mixture of youth and experience seems to be working for us. “We are now where we want to be as a team and we dominated this game throughout. Their next match will be at home to Cowdenbeath on Saturday, January 26. Meanwhile forward Aaron Millar has joined junior side Arthurlie on loan.